Late January, I made the decision to cut my hair short. Ben the Badger and I just weren’t going to get along long-term and I knew the decision was going to be drastic. I DID try to grab my phantom ponytail for around 3 weeks after the ‘Super Snip’ Event. That was kind of weird! Picture the scene: Pull a jumper over your head, reach for the ponytail, to drag it out of the jumper and … Whoa! It’s not there! Whilst sitting at my desk working, I would often pull my hair up then too. I found myself going to tighten the tail, thinking it had become loose. And … Whoa! … There was just short hair in its place. I did a lot of silent ‘whoas’ those first few days, with flappy hands doing nothing at the back of my head. Getting used to short hair was generally pretty easy though and after a couple of weeks I was finding it rather long on top (ironic). The need for spikey’ish hair was creating a bit of a Teddy Boy effect (I hadn’t quite been able to get my head around the idea of having short ‘flat’ hair!) so off I trotted to my Italian stylist for a second, shorter cut. He was cautious, thinking that I may not be able to handle it. Moi? I had to actively encourage him to be brutal with the scissors. Bless! Not so bad second time around; just 1 1/2 inches shorter. An easy few weeks followed. So, two weeks ago today, mooching about the kitchen while Himself had his early brekkers before clearing off to leave the place all peaceful (well, just me and my many selves .. I like to chat while I work .. haha) I made the decision to get the colour cut out. There was a reason fuelling the urgency …. The colour/fashion stylist I had set my heart on let me know that she will be away the whole of April. My planned ‘hair cut to silver’ was going to be too late for me to see her before her departure. Immediate change of plan. Haircut brought forward by almost a fortnight. I’ve worn warm colours most of my life and I figured I’d be needing to ditch a good few of my favourite items and, possibly, much of my wardrobe. I needed this woman in my life for an afternoon. Madam, Sire, I have ditched my vanity to within an inch of my scalp. 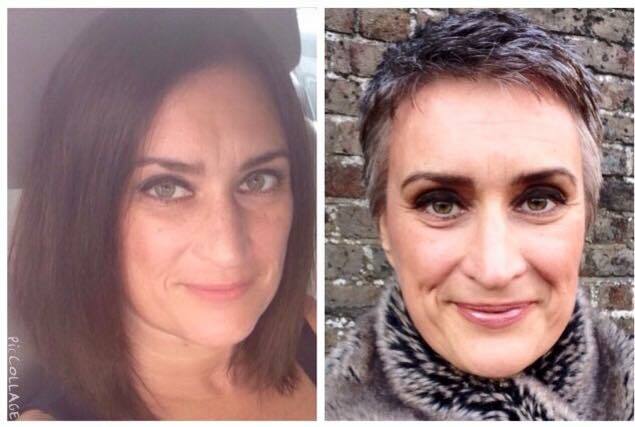 If I’m going to change from long dark hair to a pixie cut in silver in less than 16 weeks, I need NOT to feel old, or waltz out of the house looking like the bin bag we forgot to put out last week for the Council. Honestly? My GO TO brown specs looked great Tuesday morning and hideous Tue evening. I can’t wear them anymore. Luckily, all my specs are old. I’ve been waiting till I’m ‘done’ before choosing new frames. Back at the salon …. “It’s coming off!” I smiled. Hair washed, we resumed our usual places. Me – smiling in the chair. Him, scissors at the ready. A timid snip or three and I was seeing lots of hair still dusting the nape of my neck. “That’s okay. We’re GOING for it!” I insisted. Reluctantly, he lobbed off a large slice of hair. “There’s no going back now!” he laughed. Here’s the before and after that day. As you can see, I was developing rather a ‘lioness’ look! My Hair Turned Silver Overnight!!!! I have to hand it my brilliant hairdresser. We’ve known each other for 23 years and get on so well. He knows how to take care of his clients and has been a total superstar from start to finish. I’m still getting used to the boyish feel of such short hair and unbelievably, there is STILL a little dark on some of the ends. Nothing another few weeks won’t sort. It’s actually much lighter than shows in the photos above. The final look will be lighter still. Truth? I’m wondering why all the fuss about ditching the dye. The angst of those first 7 weeks as Ben the Badger crawled across my crown. The concern that I’d look in the mirror and see a much older person. I like the colours I’ve been given naturally. There are some cool browns, dark and pale silvers .. and a good dash of white. And yesterday, as we sat at the river watching the entire world go by (wasn’t it a stunning day?!) two women I talked with during the afternoon both urged me not to grow my hair. One was a hairdresser herself and kindly said she’d already noted my hair and it’s great style before we started chatting. Aside from the votes of confidence, it’s simply a huge send of relief at not having to colour again. To know that I no longer feel tied to a routine of touching up the roots every 3 weeks and enduring the tingling sensation as the various components of dye enjoy their chemical reactions on my scalp! I’m walking about with a big grin on my face, thinking ‘Thank goodness I embraced the real me.” It does feel really good not to do what society expects and just be myself. Inspired to try any of the above yet? Hi, I love your super-short haircut! So lovely! I am 8 months into growing out my gray hair and am keeping it long, but you REALLY rock your short silver hair. So glad I found your blog – I will check out the rest of it now! I just found your blog through a Google searach on going gray, and I have to say that your short short haircut looks awesome on you! I actually like the really short cut on you better than the first short cut. You still look pretty and feminine, but you also look edgy and current. I would totally do this if I knew I would look good. Alas, I have the feeling that I’ll look like a pudgy boy if I go with the pixie. Thanks Annaliese. Many people worry about going short and also ditching the dye. All I can say is that it’s impossible to tell how it will look until you try. I used a phone App to try on short wigs and figured it was worth the gamble. Look in the App store on your phone and maybe do the same?